I was at brunch the other day with a group when a friend of a friend arrived, sporting her tea cup–sized puppy, which she proceeded to hold in her lap for the entirety of the meal. The dog was peering out of her lap at her plate, and she was feeding it ice cubes out of her hand while I was trying to enjoy my stack of pancakes. While I’ve dined in many an establishment where dogs are allowed to sit on the floor next to their owners, this seemed to take it too far. Am I being picky, or do I have the right to dine without having to stare into the muzzle of a pooch? It’s illegal to bring your dog inside a restaurant (unless it’s a service dog), but in some states, such as Florida, the law explicitly states you can bring your dog to a restaurant’s outdoor seating area. In other states, this may not be technically legal, but many restaurants turn a blind eye if patrons choose to dine with their dogs. Bringing your dog is like bringing your kid. It’s common practice, but that doesn’t necessarily mean it’s OK.
People let their offspring—and pets—rage out of control and then assume you’ll find this just as adorable as they do. Shawn Magee, owner of Amnesia bar in San Francisco, was at a coffeehouse when a dog nipped his two-year-old daughter. She burst into tears. 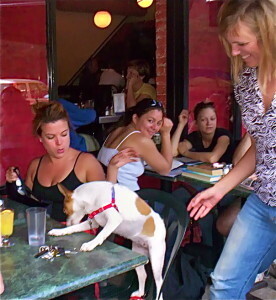 The owner apologized, but in a disconcertingly nonchalant fashion, remarking that her dog was “not usually” a nipper. I’m not saying people should never bring a four-legged friend. But the guidelines below will help keep owners in the good graces of their fellow diners. Leave barkers and lickers at home. Whether or not a dog is an appropriate brunch companion depends more on its behavior than on its size, says dog trainer Sheryl Matthys, founder of Leashes and Lovers. A docile greyhound might be fine; a Shih Tzu with an ear-splitting bark or flatulence issues won’t endear you to anyone. Prep your pup for the outing. To make doubly sure your dog will be demure, walk and feed it before going out to eat. “This way your dog is content and may even fall asleep while you dine,” says Matthys. Put your dog under the table. Apart from Great Danes, most dogs will fit under the table in front of the owner’s chair. According to Matthys, “They’re not going to get kicked, stepped on, or tripped over there, and it also helps them feel more secure, especially if they’re physically touching you.” Owners shouldn’t keep a pet in their lap, for the simple reason that most owners—like your friend’s friend—then won’t be able to follow the rule below. Ignore the dog. Owners should not pet, feed, or spout baby talk to their dog in the restaurant. Fawning over the animal draws attention to it and makes it harder for the restaurant to overlook the dog’s presence if it’s technically illegal.